The apartment is situated between Nice and Saint Tropez in Provence. The 2 room apartment sleeps 2/4 people and is situated in a 3-star apartment building right on the beach, which is designed in the traditional style of the big hotels here in Cannes. It has a vast reception area opening onto lovely gardens with a beautiful circular swimming pool, which has a central island. 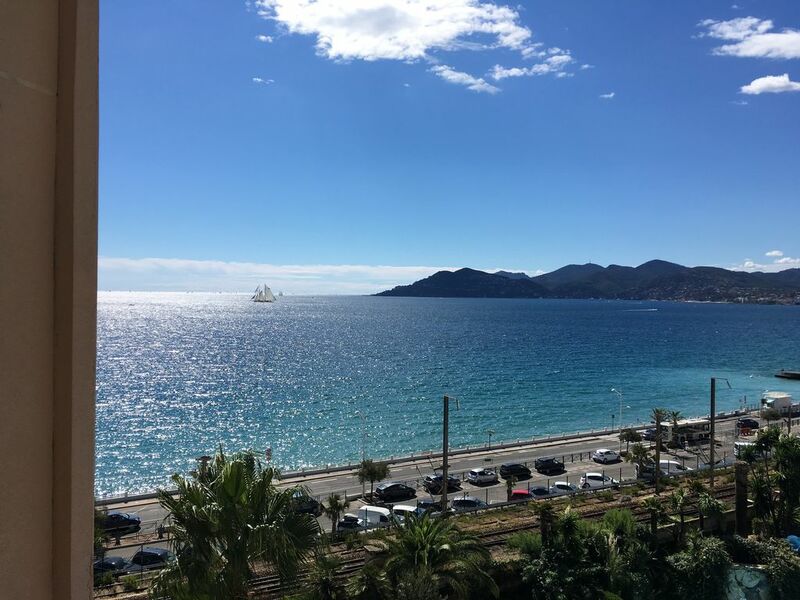 The apartment has a large balcony with wonderful views of the beach and the Mediterranean and of the pool and gardens, where you can sit and watch the sun set over the Esterel Mountains. It has an open plan living room with convertible sofa beds and a kitchen and dining area, equipped with an oven and fridge. There is also a double bedroom and a bathroom. The satellite television has channels in different languages. Bed sheets and towels are NOT included. Please bring along or rent through the owner, to be arranged and paid in advance. See more under PRICES. Wifi: your consumption you pay online to Passman, eur 8 for 1 week. Option: Underground parking eur 50 for 7 days - if you select this then you need to pay this fee direct to the landlord before arrival. After 4 unforgettable weeks (they went too fast) we wish to thank you for your kindness and service in connection with the rent of the apartments. The apartment was really wonderful to live in, we enjoyed every single day in it and spent a lot of time on the balcony every morning and night with a fantastic wiew over the Mediterranean Sea and towards the mountains by the cozy town, Mandelieu. The location is perfect, we enjoyed to take a stroll through the town every morning, go to the local market and shop for groceries and enjoy a cup of coffee and try to experience the daily life of the french people. Furthermore it is nice that Cannes is within walking distance. We have enjoyed every single moment and we know that our children did too so there is also full satisfaction from their side. We shall be happy to come back in 2 years. Once again thanks. A recommendation for guests who don't have a car available. We managed all our excursions using public transport. It went very well. From Nice airport by bus 200 to Cannes, change at Hotel de Ville to bus 1 or 2, get off at Mairie Annexe (opposite Ibis Hotel). Total price including transit 1€ . That is an unbeatable price especially by the current gazoline prices. Also excursions to Vence, Grasse, Antibes and elsewhere are trouble free to make. The tourist bureau in Cannes is very helpful in this respect. Cannes la Bocca: daily market on the main road (5min by foot). Fruits: Mangos, pineapples, strawberries, melons... taste differently and smell so! Nice: the ice cream bar 'Fenocchio' on Place Rossetti - around 100 sorts of ice. Antibes: Marineland - even our 15 year old son who like many others at this age find everything boring was totally exited about Marineland. Monaco: Oceanographic Museum with the Restaurant at the top with a panoramic view over Monaco. Our son found the Museum very interesting too. This time we also saw the change of guards at the Palace in Monaco. That was great fun too. Not to forget: On sundays and holidays parking on the streets is free also in France (one can save a lot of money). In Monaco there are elevators everywhere that connect the lower part of the town with the upper part. When you use these you save a lot of time and energy. We hope that we can come back to Cannes and in that case we shall contact you. Again many thanks! We found the location to be convenient and the apartment is comfortable and well provided for. I especially liked the orientation which means the balcony stays in shade until the afternoon so it is not too hot when we eat meals outside. The local supermarket and boulangerie are excellent and the quality of the fresh fruit and vegetables as good as a market. If you want the buzz of central Cannes, the block is just a €1 bus ride from the festival park, which was great for people watching. I think other guests might like to know where the bus stop is (outside the Ibis Hotel). We had a really good week and on the last day, we rented a car to drive to St Paul de Vence. The boys thought the lunch in Le Tilleul Restaurant was fantastic! Thank you so much! The view from the apartment was sensational, everything practical and well-organised and your directions and advice perfect! I didn't believe that grieving for my father as I was, I could possibly enjoy myself as much as I did! In fact, I found myself able to grieve more freely and think more clearly while swimming or visiting beautiful places such as the gardens of Renoir's house at Cagnes. We loved the location, the sea, the pool, the ambiance - everything!It is so easy to visit so many lovely places and the little town and market are delightful. We can't make holiday plans for next year yet. If not for that, we wouldn't hesitate for a second to ask you to reserve the same apartment for the same weeks next year as we absolutely loved it!!!! Yet again, thank you so very much for a truly excellent holiday experience! I hope that your summer has been lovely too. All our very best wishes and many, many thanks, Anna and Robin Taylor. Just back last night from two brilliant weeks in your apartment in Cannes. I do not think there is anything you can say about apartment apart from FANTASTIC!!!!!!! We hope that we will be able to visit again. In the not too distant future. We look forward to spending more time in your fantastic apartment hopefully next year. We would like to thank you again for letting the apartment in Cannes over Christmas 2007. Everything was okay and we enjoyed our stay and the wonderful view off the balcony while having our dinner, especially during meals since by these temperatures it was possible to eat outdoors also during December. We found what we expected from the description, the contact with the owner proved to be easy and sufficient. The site of the apartment in the MAEVA building was in walking distance to nearby shopping centers; the walk towards Cannes centre took about 20 min. along the seaside. Weather was fine, 13-14 degrees C and little wind. Ideal conditions for excursions and the holidays in the South of France will remain a vivid memory for a long time. The train to Monaco or Nice was a five-minute-walk away. We would recommend this accommodation to anyone who would love to explore La Côte d'Azur. You can rent a parking spot in the underground parking from us, eur 50/week, highly recommended especially during the high season. 4G Router installed. You pay online for your consumption starting from eur 12.80/1 GB. The apartment is located on the 5th floor. It is a 2 room apartment for 4 people that have 30 sq. m. plus a balcony of 8 sq. m. It is cleverly utilized and serves the purpose well. You have a wonderful balcony with a splendid view to the sea, the beach, the coast towards the west, the Esterel Mountains the swimming pool and the palm tree garden. The apartment is fully furnished. Entertainment: There is access to a bar (summer time), a pool hall with piano, a terrace. There is a coin wash in the building that accepts international credit cards with wireless payment. There are electric heaters, one in each room and a fan (ventilator). Electricity consumption is included in the rent. An underground video supervised parking lot is available as an optional extra. Smoking is not allowed inside the apartment. Please smoke only on the balcony. The use of a digital safe is included in the rent. The view is spectacular, the weather perfect and the people very helpful and friendly. Highly recommend it. Very good location! My daughter enjoyed the pool. We had good time there. Great to hear that! Welcome back anytime! My mother and I stayed in one of David's 1-bedroom apartments in this complex for a week in March. The apartment was exactly as described and spotless. David provided very detailed instructions and recommendations prior to arrival and responded to all our emails quickly. The view from the balcony was wonderful overlooking the sea and the complex's main pool. La Bocca is a residential area and is served by several main bus routes. You can even walk to the commercial center of Cannes and to the La Bocca train station. There are plenty of restaurants, corner stores (we used the Huit-a-Huit for breakfast and dinner basics), bakeries, and cafes. I would definitely recommend this apartment and area. Thanks, your feedback is much appreciated. Solid and stylish building, good access 24 h, convenient garage downstairs, good apartment planning and balcony, good neighbourhood and services nearby, good transport connections, all basic suplies for living available. Very good, quick and trustworthy communication and contracting, good instructions, everything available via internet. Some advantages might be done for better TV (sometimes buzzing) and wifi internet connection. Good holiday resort even in winter. apartment. We found the location to be convenient and the apartment is comfortable and well provided for. I especially liked the orientation of 608 which means the balcony stays in shade until the afternoon so it is not too hot when we eat meals outside. The local supermarket and boulangerie are excellent and the quality of the fresh fruit and vegetables as good as a market. If you want the buzz of central Cannes, the block is just a €1 bus ride from the festival park, which was great for people watching. (outside the Ibis Hotel). We had a really good week and on the last day, we rented a car to drive to St Paul de Vence. The boys thought the lunch in Le Tilleul Restaurant was fantastic! Thanks Sally, glad that you and your kids enjoyed it. Mon compagnon et moi avons passé un excellent séjour dans cet appartement! La terrasse nous a permis de profiter des beaux jours d'avril et permettra à une famille de 4 à 6 personnes d'en faire tout autant car il y a de la place. Autre point positif, l'accès à Cannes Centre est très facile en voiture depuis l'appartement. Ou à pied en longeant le bord de mer en 30 min pour une balade en soirée! Place de parking à mon sens indispensable pour la période estivale, vous gagnerez du temps. Nearby is the village of Mandelieu, which has an excellent golf course and 8 kilometres of fine sandy beaches ending at the foot of the Esterel hills. In the other direction is Cannes itself and all its magic. The International Film Festival is held here in May. The Boulevard du Midi which is a lovely beach front boulevard runs in front of the apartment building and is a popular pedestrian street with palms. Grasse nearby is famous for perfume and flowers. Mougins is a traditional provence village with great restaurants. Bettwäsche/ Handtücher sind NICHT im Apartment. Entweder selbst mitbringen oder durch der Vermieter mieten, ungefähr Euro 15/ Person/Woche, dazu eur 10/Appt an die Putzfrau um es abzuholen und rückgeben. Bestellung und Bezahlung minimum 4 Tage vor anreise. ENGLISH: Linen/towels: are NOT in the apartment. Please bring along or rent through the Owner at apx eur 15/per person per week plus eur 10/apt for the local helper to pick it up and return it later. This needs to be ordered and paid for at least 4 days before your arrival. Francais: Draps et serviettes: NON fourni! Veuillez porter ou louer par le proprietaire, env 15/par personne par semaine plus eur 10/appt de frais pour la femme de manage qui cherche et retourne la linge a une blanchisserie. Vous devez nous le signaler au minimum 4 jours avant votre date d'arrivée et le regler aussi avant d'arriver. W-LAN: Verbrauch im Preis nicht drin, eur 8 für 3 Tage an Passman zu bezahlen. Wifi consumption is not included, you pay for your consumption online, from eur 8 for 3 days. Wifi: Consommation non-inclus, eur 8 pour 3 jours a regler a Passman enligne.